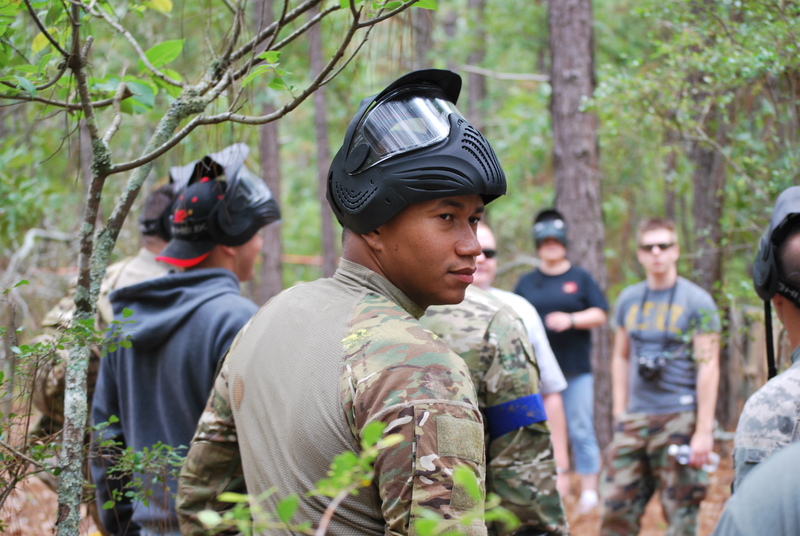 An eager crew from the Fort Gordon Warrior Transition Battalion suited up last Friday for a tournament of mock-combat at All Prime Paintball in Aiken, South Carolina. “This was just what we needed to get our minds off our everyday appointments and injuries,” said Anthony, one of the 37 wounded warriors who attended the paintball event sponsored by Freedom Alliance. For all the rivalry and competitive spirit, the teams were not without good humor and camaraderie. Many of the players were excited to learn that their commander, LtCol Brian McCormack, would be joining the games, and they anticipated the chance to shoot at him! CPT Santiago was also a favorite target, but he didn’t seem to mind the extra attention. By the end of the day, he wore one extravagant smile and numerous bright yellow splotches on his uniform. After each round, the teams emerged from the field laughing about the grand schemes and strategies in the art of paintball war. One soldier joked that they were wounded warriors re-injured in battle—this time it being a colorful conflict. Unable to participate in the sport, Sarah came along anyway to take photographs. “This is my therapy,” she said, glad for the opportunity to break loose for a while. Sarah, whose back was injured by an IED during her recent Afghanistan deployment, was a helicopter mechanic and is currently stationed at Fort Gordon while she is undergoing rehabilitation. She is looking forward to being home with her husband in Orlando, where he is fighting for his own recovery from cancer. The group played a total of six games, refereed by an excellent ensemble of All Prime Paintball employees, several of whom were also veterans. A generous lunch was catered by a local Subway® Restaurant. At the end of the afternoon, LtCol McCormack presented a plaque and certificate to Freedom Alliance for their contributions to the Warrior Transition Battalion. Activities like this allow America’s wounded heroes a chance to reduce stress and get away from their seemingly endless routine of doctor visits and physical therapy.